While membership is unrestricted as to residence, the Club's primary purpose is to be representative of the Samoyed Fanciers in it's immediate area. Adult voting and junior non-voting memberships are available. Applicants for membership shall apply for membership after having attended two meetings. 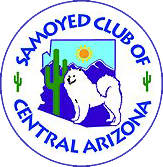 While membership is to be unrestricted as to residence, the Club's primary purpose is to be representative of the SAMOYED fanciers in the Central Arizona area. If you are interested in becoming a member, please contact the SCCA Membership Chair, Amy Schmerman.